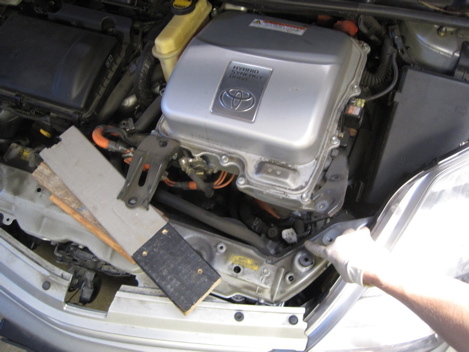 The second generation Prius, model years 2004-2009, uses a 3-way valve to control coolant flow between the engine, the hot coolant storage tank (thermos), and the heater core. Thus it’s involved in heating the passenger cabin (when requested), as well as reducing cold start emissions (with the coolant storage system). Anything that has to do with emissions illuminates the “check engine” light; if something goes wrong with this valve, the “check engine” light comes on. The fix is replacing the valve. It’s mounted along the driver’s side frame of the engine compartment, near the radiator, and can be removed by elevating the inverter and pulling the valve out from the top. 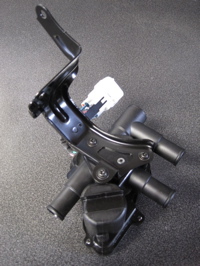 With good use of hose clamps, the job can be performed without loosing more than a spash of coolant. Warranty time for valve replacement, as listed in the TSB, is 2.1 hours. Luscious Garage charges 1.75 hours.